Basement: Yes, Full "Partially FInished, There is an outside entrance." 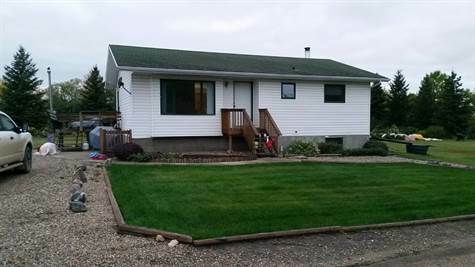 This is an appealing and unique small farm with a great location close to Jackfish Lake and Murry Lake. Excellent for some livestock, and or a repair/trucking business. This property has an attractive park-like setting with large trees, flower beds, and garden area. The cultivated land 95 acres (+/-) can be sold for $200,000 and the 10-acre acreage can be sold for $280,000. Subdivision to be done once an unconditional offer is accepted. -	Wood arch rib Quonset, insulated, lined (1999), 40 x 60, cement floor walk in-floor heat (2009), propane boiler for in floor heat (2018), upgrading electrical panel to 100 AMP service. Also has a grain burning furnace 100,000 btu. Asphalt shingles, 16 x 14 overhead door, 1 walkthrough door. North of North Battleford to HWY 26 go west 2 miles, then turn North about ¼ of a mile on the left hand side.